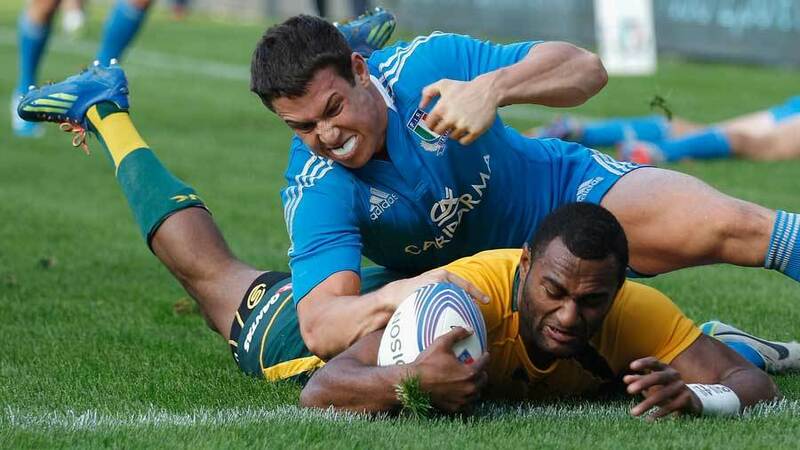 Australia scored seven tries as they smashed Italy 50-20 in Turin on Saturday. The Wallabies lost 20-13 to England last weekend in what was their eighth defeat of the year, but managed to put in a solid performance in Turin to see off the Italians. The home side began strongly and took the lead through Luke McLean before Australia struck back with a brace of tries from Nick Cummins and one apiece from Ben Mowen, Tevita Kuridrani, Adam Ashley-Cooper, Joe Tomane and Israel Folau. Tommaso Allan added a second for Italy in the dying minutes but by then it was too late. Italy started the game brightly and took the lead after just four minutes as Alberto Di Bernardo kicked over a penalty. The first scrum came minutes later and had to be re-packed three times after collapsing. Matt Toomua stole the ball away for the Wallabies, with James Horwill and Kuridrani on the other side, but Italy put up a good defence. Kuridrani lost the ball following a high pass and the home side were soon on the counter attack as they found space on the right and Australian-born full-back McLean crossed over for the opening try to make it 8-0. Di Bernardo made no mistake with his conversion. Australia began to attack and their efforts soon paid off as they came back with a try of their own 15 minutes in. Kuridrani and Folau put the pressure on for Ewen McKenzie's side with Sitaleki Timani just short of the line, while Quade Cooper set up captain Mowen, who beat Sergio Parisse and crashed over for a fine try. Cooper was successful with a conversion. The Wallabies continued to push forward and Cummins made a break for it, offloading the ball to Kuridrani and the Brumbies outside-centre crossed over for their second try - with Cooper again on target with the conversion. Australia scored again as the game approached half-time as Will Genia collected the ball after exploiting an an overlap in the ruck following a lineout and he set up Cummins before the Italian defence could get into position. Jacques Brunel's hosts tried to pull something back just before the break but could not add to their points tally, leaving them trailing 19-10 after the first half. The Azzurri started the second on a better footing than they ended the first and won a lineout from which Di Bernardo was in possession but lost the ball under pressure from Michael Hooper. The next lineout a minute later ended in a bit of a brawl as both sides battled for the ball and Simmons was penalised. But it was the Wallabies who extended their lead as Cooper collected the ball after James Horwill won a lineout, and the Queensland Reds fly-half found Cummings with an excellent pass for their fourth try. As the match approached the hour mark, Australia continued to punish the home side after Genia and James Slipper almost combined to score before Ashley-Cooper trailed the outside shoulder alongside Cooper and took the pass to fire his side further ahead. Italy were not for giving up and came back as Lorenzo Cittadini crossed over to reduce the deficit but it was not long before Australia scored again. Christian Lealiifano added a penalty and it was another replacement, Tomane, who crossed over moments before Folau claimed a try of his own after collecting Tomane's pass. Lealiifano was on target with both goals. Following a couple of incomplete scrums, the home side won the ball and ran hard down at the other end as Allan saw off Saia Fainga'a to record a close-range try and bring the score back to 50-20 in the dying minutes.